What’s this, I’m posting on a Monday?! 😉 This post was ready to go last week, but since we had so much fun content already going out (Glow Getter, Ask Angela, and the next issue of In The Glow! ), I decided to hold off until Monday for this one. Thanks for all the positive feedback about the reboot of Things I’m Loving Lately, by the way. 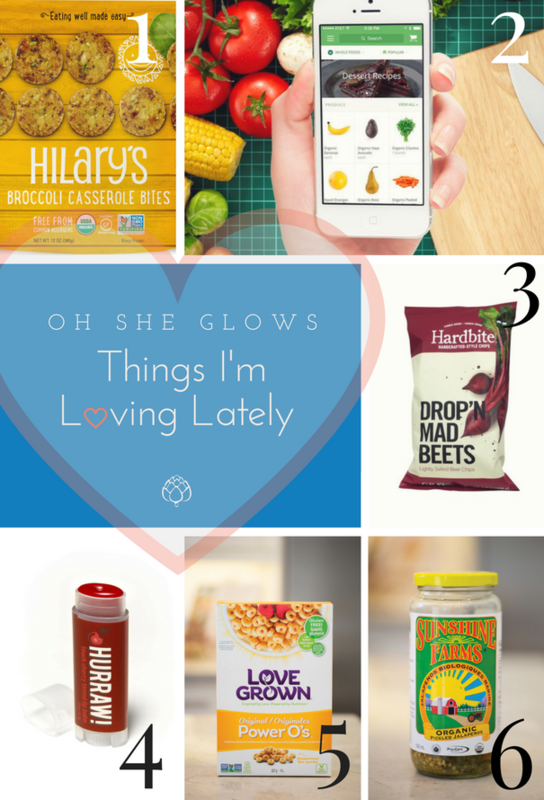 It’s such a fun way for me to share the things I use and love in my everyday life, and I enjoy hearing about the new things you’re diggin’ too. So feel free to spill the beets, errr…deets, below! As always, these posts are never sponsored, but I’ll occasionally have an affiliate link or two included in the roundup. I discovered these frozen casserole bites when I was looking for super-fast dinner options for the kids. We definitely don’t have a made-from-scratch meal on the table every night, so I was delighted to find these mini veggie burger patties packed with awesome organic ingredients: cooked whole grain millet, broccoli, cooked white beans, expeller-pressed coconut oil, carrot, onion, garlic, apple cider vinegar, psyllium husk powder, salt, arrowroot, basil, and oregano. The kids love them dipped in ketchup, and I try to always have a bag in the freezer for those emergency don’t-know-what-to-cook situations! If you’re in a similar pinch, I recommend throwing some on a baking sheet with sweet potatoes fries and serving with a side of sliced avocado for an effortless weeknight dinner option. Let me preface this by saying that I’m someone who loves grocery shopping. It’s something I tend to look forward to, especially on those rare, heavenly occasions when I’m able to go shopping by myself. But sometimes I can’t leave the house to get groceries (like during nap time), and find myself stuck needing ingredients to test a recipe. That’s why I was so excited to hear that Instacart, an app-based grocery delivery service, is now available in my area. I simply add food to my virtual “cart” through the app and then my order magically arrives on our doorstep within an hour or two. I also love that I can text my “shopper” and make adjustments as they shop away. I only use Instacart when I’m in a pinch, but so far it’s been a huge help when I can’t leave the house to get groceries. More ingredients = more recipes! Can you say win-win? I’ve been using HURRAW! lip balm for years, but this cherry flavour is new to me and it’s my favourite yet. The red hue leaves a subtle hint of colour, and when I don’t want to go all out with a bold lip colour this is my “no make-up” go-to. Best of all this moisturizing balm is vegan, organic, and made using cold-pressed oils.